Why blood booster foods needed by pregnant women? Because pregnant women are at great risk for experiencing anemia, or low levels of hemoglobin (Hb). So the blood booster here means the foods that can increase hemoglobin levels in pregnant women or possibly prevent to avoid anemia (hemoglobin levels below normal). Nothing special here, we know that the many types of food that can be used to blood, but not everything can be eaten by pregnant women. Because pregnant women should not eat any thing because it must be ascertained first whether it is safe for pregnancy and fetus. During pregnancy, are going on in full swing cells forming new red blood to the fetus. Anemia in pregnant women occur when no intake of food sufficient for the formation of red blood cells that, in these conditions as if the mother's body succumbing to meet the demand fetus. Nutrients are important in the formation of red blood cells which are iron and folic acid. So no wonder, the most common cause of anemia in pregnancy is iron deficiency (~ 85% of cases) and folic acid. Well, from here already answered yes, that the blood booster foods for pregnant women is the kind of food that is rich in iron and folic acid. But it should be safe for pregnant women. What are the food in question? Apply a balanced diet which includes foods high in iron can help reduce the risk of anemia during pregnancy. Because iron is a vital substance needed in the production of red blood cells, then pregnant women are advised to eat foods rich in iron as blood booster foods for pregnant women. Meat (red meat, liver, etc.). Foods rich in iron over, really can help increase blood during pregnancy and are very useful in combating anemia and the symptoms it causes. Does it need iron supplements? This needs to be discussed with the doctor. Most doctors recommend that pregnant women continue to consume as much as 30 mg of iron per day, ie during the second and third trimesters of pregnancy. Your doctor may increase the dose when you have iron deficiency anemia. Vitamin C helps iron absorption so that pregnant women are encouraged to eat foods rich in vitamin C, such as orange juice, green peppers, broccoli, cantaloupe, strawberries, and cabbage. Caffeine can inhibit iron absorption. Try to take iron supplements or foods high in iron at least 1-3 hours before or after drinking or eating foods that contain caffeine. In general, the caffeine found in coffee products, tea, cola, and chocolate. Iron can be lost in the cooking process. Try to cook food in a small amount of water and in the shortest time possible. Constipation is a common side effect that occurs when you take iron supplements. To help relieve constipation, then eat fruits and vegetables. Drink at least eight glasses of fluid every day and do moderate exercise (as recommended by a physician). Folic acid is also important as adding nutrients into the blood of pregnant women, in addition, it turns out these substances have benefits in preventing kececatan born, so it must be consumed in sufficient amounts every day by pregnant women. Vegetables should not be eaten raw, cook by steaming or if not possible boiled with a little water and cook in a short time. Fruits should be washed before consumption, wash-skinned fruit with a special soap and running water before peeling and eating them. 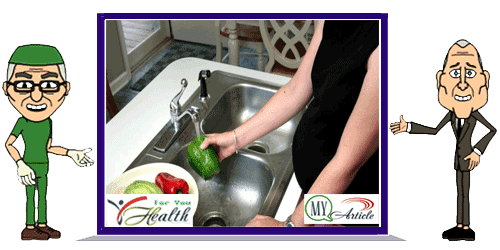 All of these aims in order to kill bacteria when food was contaminated by microorganisms harmful to your pregnancy.